I shuffled along the path. My boot grips bit into the compressed snow. I was grumpy. 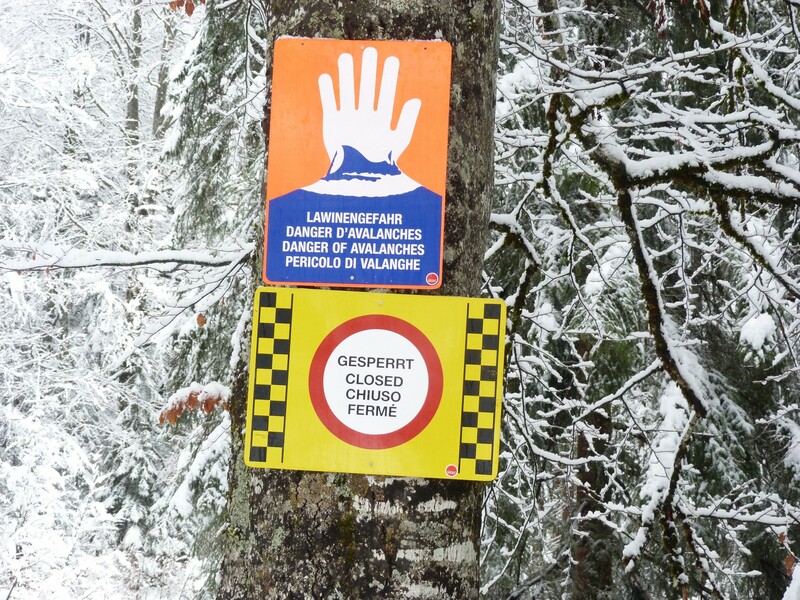 For the first time in many years I would be unable to play on the Alps’ best cross-country ski trails. I was forlorn. Devastation. Every year during these festive days, we came to this much-loved winter resort. Each day, I would ski kilometre after kilometre, hour upon hour. It was my yearly fix and I so enjoyed every second of skiing up, down and along in the winter sun or in blizzard, through forest and over alm. But not this year. I was recovering from months of very painful tendonitis in my right shoulder. I was unable to use poles. I knew I was going to be sad during these days – how would I cope? I shuffled along the path. However, the previous evening, being Christmas Eve, there had been an exchange of Christmas gifts. My daughter’s Russian in-laws, who had flown from Moscow to join us, handed me a large parcel. Under the gift-wrapping was a pair of snowshoes. Spasiba! Balshoye spasiba! (Thank you! Thank you very much!) I smiled! In a flash I replayed the YouTube clips in my head, seen whilst I had been inactive at home in the UK and dreaming of travelling over snow. But, surely you need poles don’t you? No, remember the one with those girls in that car park? They didn’t have poles, did they? So, here we go. Unzip my bag. Get these shiny new babies out. Sit down. Loosen the toe straps. And the heel. Oh, better take off the little plastic point guards on the base. Tighten everything up. Stand up. Wow, they’re on my feet! I moved one foot, then the other… I was walking…well more like staggering. It felt a bit plod like. I was a robot following the route uphill. I had to work quite hard—poles would have helped I’m sure but were, for me, totally out of the question. Left then right. After some effort, I reached more level snow. The trees briefly parted revealing a tremendous vista with the very shapely 2661 metre Hohe Munde Mountain Way across from where I gazed. Further on along this ridge, I looked down on Seefeld. What views! I found myself enjoying myself; for years I had been coming to this region, but was now seeing it all anew with a different perspective. Continuing, I began to go downhill—quite steep in places. In front of me I spotted three fellow snowshoers. We met, we nodded. As they passed, I spun around. More downhill and then I had completed my first alpine snowshoe trail. To celebrate, I decided to do the whole trail again, but this time in the correct direction. The following day I completed the Gschwandtkopf Route from the centre of Seefeld. It went through the forest parallel to the Reitherjoch Alm downhill ski run, up to 1,505 meters before a very scenic descent. The next day, my Russian son-in-law, Nik, joined me (after renting some snowshoes in the village). Again, it was a visit to the Brunschkopf Route where I had my initiation. He too was a first-timer, but used poles. And he too found the experience great fun. I had all but forgotten my early “no-ski” depression. The following day Nik and I caught a bus to the village of Scharnitz around 10 kilometres away to the northeast; we were off to the Birzlkapelle Route. Armed with our new skills of walking with wide legs, going both up and down terrain, we were ready for another snowshoe adventure. After a tricky start because of a lack of signs and snow (we discovered that snowshoe crampons lock into both soil and wood) we began to ascend and before long the snow had thickened. A warm frontal system had arrived over the region during the night, causing melting lower down but depositing new snow at higher elevations. 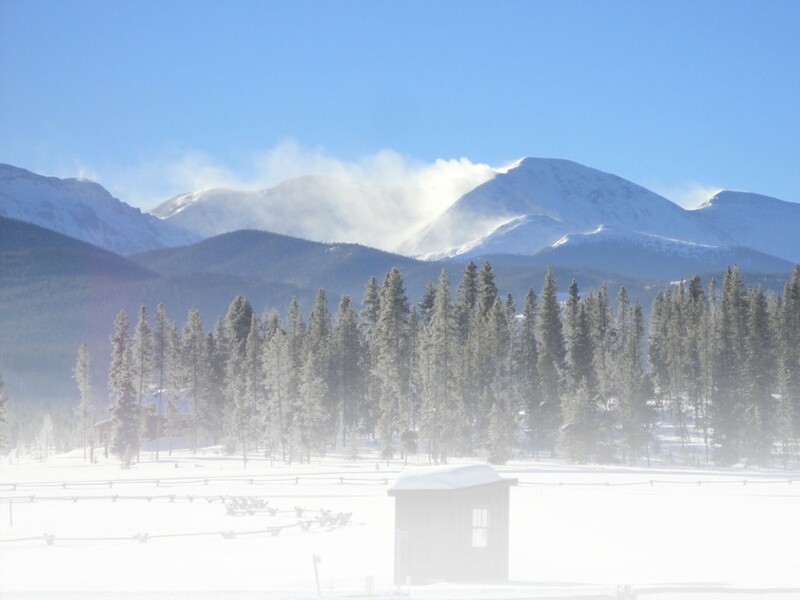 The most striking mountainous scenery was being draped in a thick, soft and fluffy covering. Tranquility… as white flakes gently float. On up. Snow deeper and deeper. Suddenly, there in front was a white hand on a sign saying Lawinengefahr in four languages. (Danger of avalanches!) We could see the obvious perilous line coming straight down the mountainside—a place with either small or no trees, all covered with so much new snow. A long-established release track for the over-burdening of snow. We turned to safer ground and began our descent. A little further in the silent surroundings. Suddenly, Nik pointed with some interest to a line in the snow. Chamois tracks! 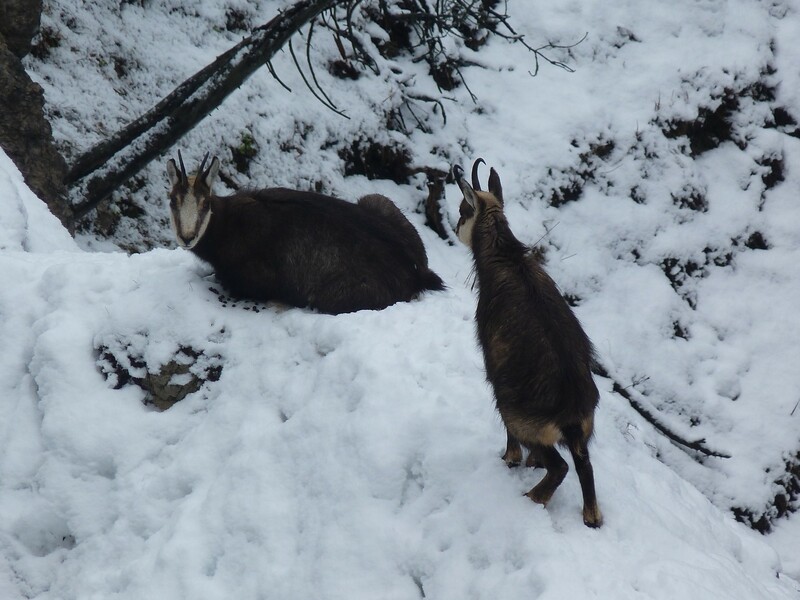 During winter, these Alpine deer should be in semi-hibernation, curled up in a snow hollow conserving energy. We walked very quietly and yes, to our left, on an edge above a steep bank were five subdued chamois. We kept still and clicked. They kept still and watched. 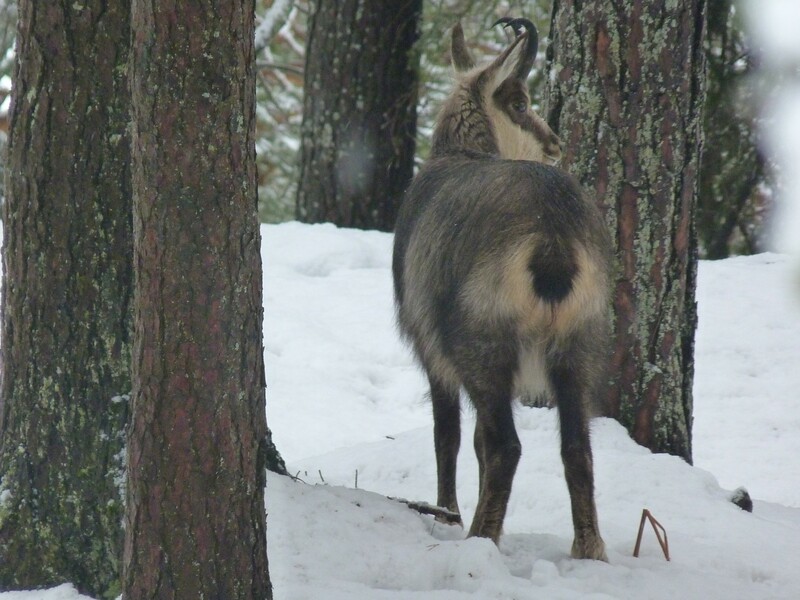 Grey brown creatures with striped head, curved horns and white rump. Their coats were thick. Beautiful! I realized that the relative slow speed of snowshoe travel had helped in their detection. We had time to be aware and look around. The following day I was on my own. I was realizing I had becoming beguiled by these large feet—the hook had well and truly been swallowed. I caught a bus to the wide valley of Leutasch and alighted beneath the mountain of Hohe Munde. My aim was to complete the Rauthhutte Route. It was a different day. After snowing for many, many hours, the clouds had moved on, the sun was out and the temperature had dropped. I soon found the sign for the start of the route, so on with my snowshoes. I was off. Hey, this snow is fresh powder! I slowly went up through the steep forest. Every so often as I walked, snow would fall in gentle clumps from branches. The images as I climbed, were intense – brilliant white, inky trees, distinct dark shadows and cobalt skies. It took about an hour to walk through the forest and out onto open mountainside. There, the snow became even deeper as I slowly headed up across this soft blanket. The view now was one of white undulation rising to a distant summit punctuated occasionally by smaller trees. The way flattened out towards a large building where numerous people busily peeled off skins from the bases of skis. Indeed, this was the top of an old ski run—now only used by those prepared to truly work for their downhill thrill. The view was breathtaking: a flat valley floor of forest and open snow surrounded by a host of shapely Tyrolean peaks, all under a winter sun sky. Time to descend. I turned and started my downward steps. But wait! Wow! That was amazing! Each step swooshed so gently through the soft powder – a kind of weightless slow motion. Left swoosh, right swoosh. This was sheer pleasure of movement as each gentle compression followed the other! I glided quite steeply as I drank in the panorama of the whole Leutasch valley beneath me. Several high-speed skiers shot past and also out of nowhere, a line of fellow snowshoers. I stopped and studied their journey down off the open powder and into the forest further down. I decided to follow this interesting route, off the official trail. 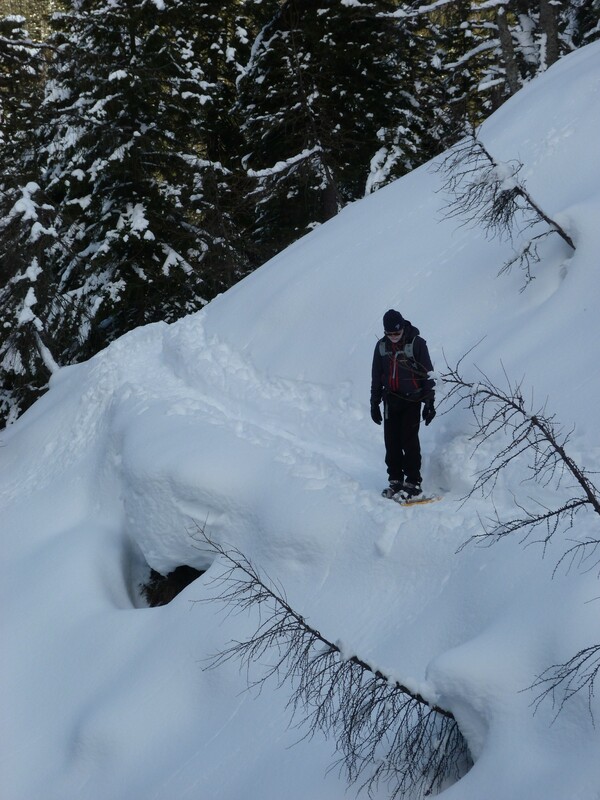 Eventually, after steep banks, fallen trees and small interesting glades of snow, I found myself back at valley level. 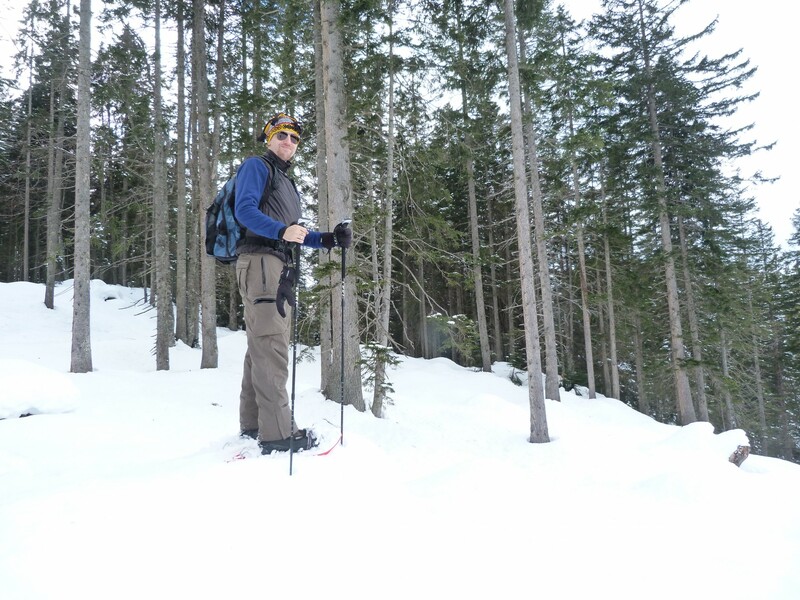 The following days were spent completing the remaining snowshoe trails: the Hohe Fluder , the Muhlberg and Isarsteig – Nederweg Routes. All great fun and with lots of atmosphere and interest. 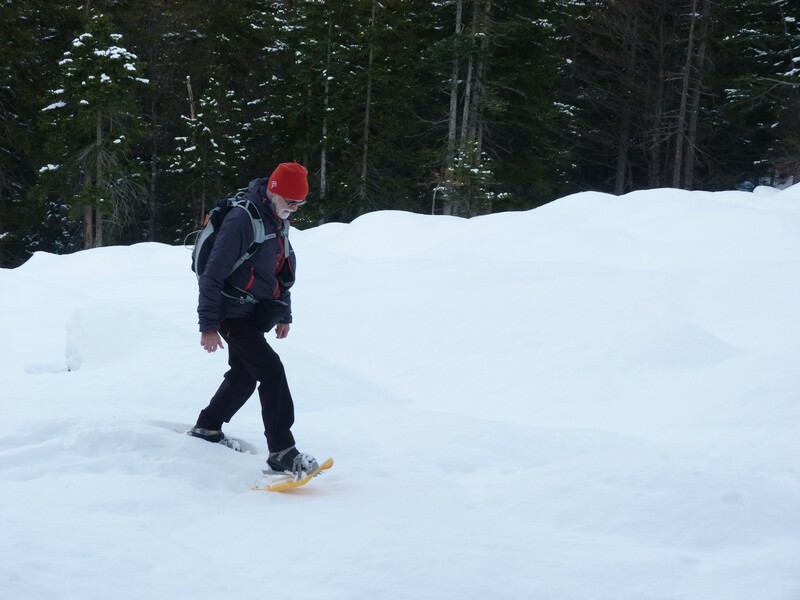 It was during these outings that I personally concluded that snowshoeing was slower just like mountaineering. For me, there seemed to be more time for looking and appreciating landscapes amidst high elevations. And there we have it! My initiation into the world of snowshoeing was complete. I had gradually become totally absorbed. 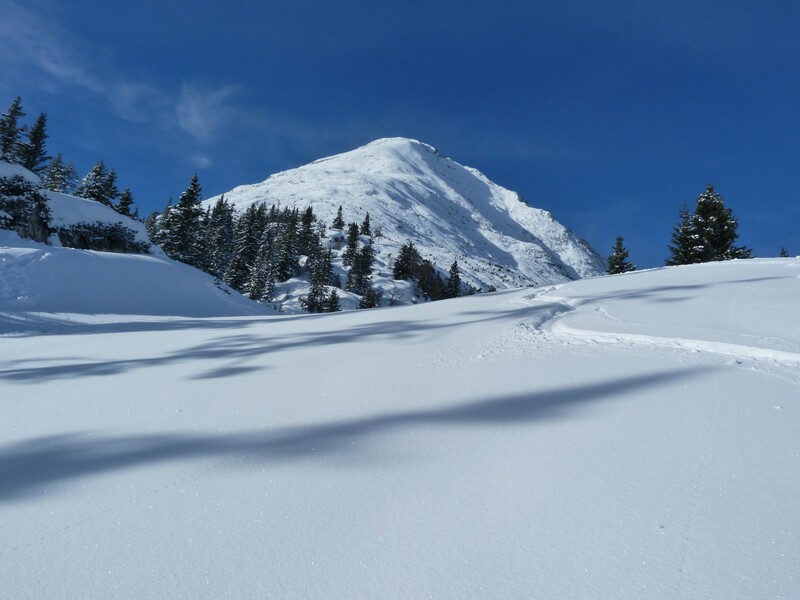 The deciding factor had been the day of the beautiful snow on the Rauthhutte Route on the Hohe Munde mountain. Over these days I had metamorphosed from a person in despair, into indifference at this new mode of travel, to totally loving the entire snowshoeing concept. I had been successfully wooed. I was a new fan. To Nik’s Mum and Dad a big…Spasiba! Question is, what to do next year when I get to Seefeld? Cross-country ski or snowshoe? Well done! I have moderate experience snowshoeing in Colorado. I live in the UK now and have been looking for places in Austria/Germany with good Nordic trails. Seefeld came up in my searches. Your description of the views sound lovely but the trails seem not well marked, would you recommend for someone alone? It’s always important, if you go by yourself, tell someone where you plan to go and for how long. Or, go to iNeverSolo.com and set up an account. Always try to snowshoe with a partner, if possible. If the trails aren’t marked well, bring a compass and become familiar with the area by studying maps. 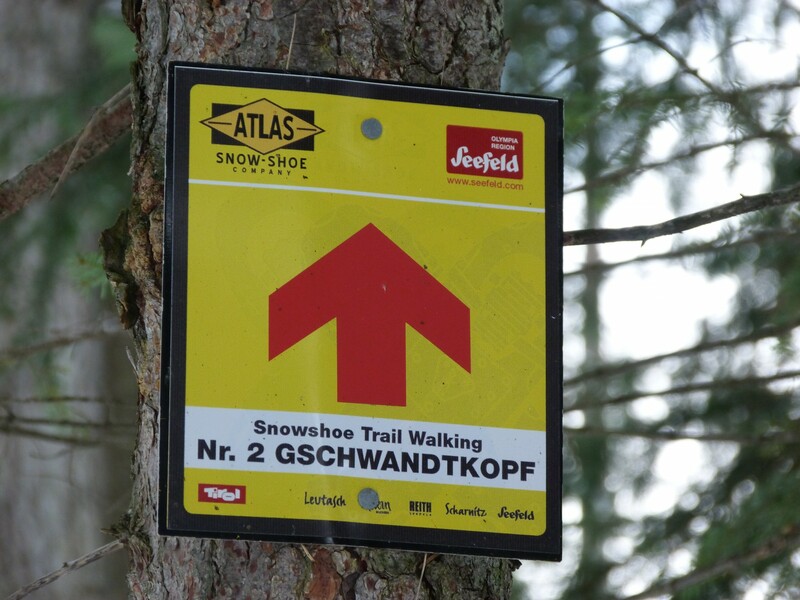 The snowshoe trails around Seefeld are well marked. Whether to go alone depends on your experience. I agree with Ryan, always tell somebody where you are going if you go on your own. There are local maps available and there are online descriptions. Don’t forget to get the latest weather forecast from the Information Centre in Seefeld. 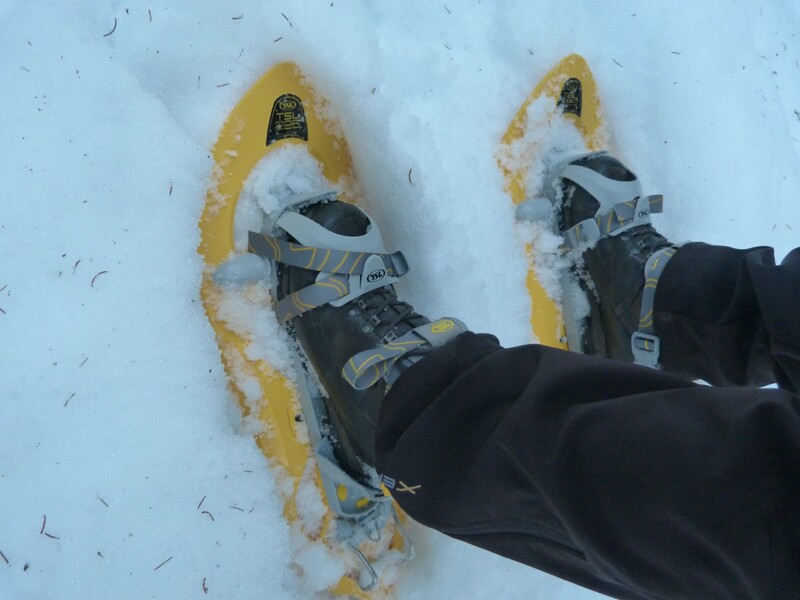 There are local snowshoe tours available, again the Information Centre can give you details. But, it is worth experiencing the beauty of these Tyrollean mountains! Enjoy. I am wondering if this is the same Mr Bunyan who taught in Lancashire in the early eighties. I was your student at primary level if you are indeed the man concerned? Yes, it is the very same Roger Bunyan. And, I remember your name! You were in my class at St. Philips in Atherton, yes? That was a long time ago. I have now retired but still get out into the mountains as much as I can. I wish you well with your writing project, it sounds interesting. Best wishes and good luck. Roger.